College exams are no joke, people. You can’t just show up and assume you’ve absorbed everything you’ve learned in class. Studying for college exams takes time and patience. Find a good place to study. For me, I can’t study somewhere where I will know a lot of people, because they will distract me. I have to be in a room, secluded or I will end up people-watching. I, personally, don’t like the library because there is too much going on. I try to study in my dorm’s study rooms or in the brand new study rooms on TCU’s campus. It makes it easy to seclude yourself. Study guide? USE IT. If you’re lucky enough to have a study guide, absolutely use it. Know it inside and out. Your professor didn’t take the time to write it out for nothing. He/she wrote the test, he/she knows what will be on it, so listen to him/her. Ask questions. Many of my professors will take time out of the class before the exam to answer questions. Not only is this the perfect opportunity to ask anything that’s still baffling you, but it’s a time to listen to what others are asking. Often, the professor will hint that something will or will not be on the test. This could be very helpful to you! If your professor does not have time for questions in class, go to their office hours! These are meant to help you, so utilize them. Have a study buddy/group. I’ve found that when I’m studying alone, if I don’t understand something, I get stuck in a rut. If you’re with others that’re studying the same subject as you, you can get an explanation from them, or you can talk through the problem together. It makes it way easier to get things done, but only if you’re all productive. Find an effective way to study. I’ve recently discovered the method of making a visual study guide. Instead of simply writing terms and definitions on lined paper, I use blank, computer paper to write everything I need to know, making it visually appeasing. This also helps if you’re a visual learner (which I am), because you can easily picture where the term is on the paper instead of the monotonous lines of terms. 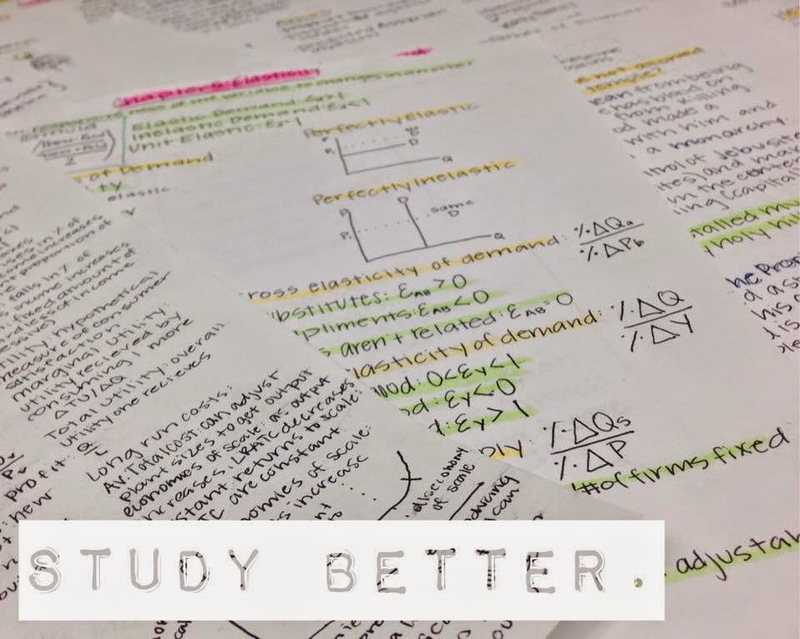 Other ways to study include typing out the terms and definitions, making flashcards, making a quizlet, or doing questions and answers out loud with a partner. All of these depend on what type of learner you are. Cut out distractions. I get extremely distracted by my phone. The only way I can cut this distraction out is if I turn it on airplane mode. I will give myself a certain time I can check it, but only for 10 minutes. My laptop is the same way, but I’ve downloaded Self Control so I don’t get distracted. (Also available for Google Chrome). Bring food. If I’m hungry, I get cranky (in our house we call it hangry). Be sure to bring food to keep you from getting distracted from a grumbling stomach. Make sure its healthy too, sugar candy is just going to make things worse.